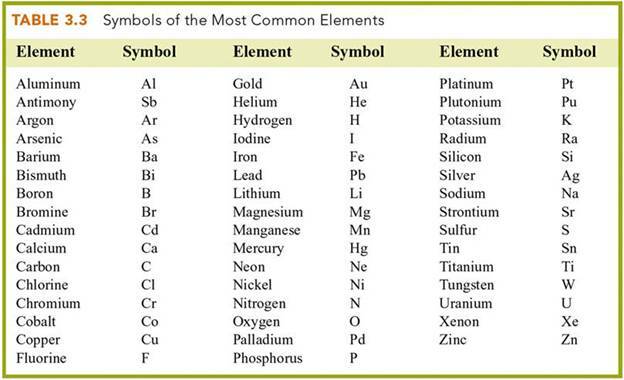 CHM 1025C Student must learn the first week of class the correct spelling and the chemical symbol for all the elements in Table 3.3 on page 47 of the Hein textbook. Part of the first exam in Week Two (M-1i Part B) the student will write either the name or symbol for 40 of these elements. and complete the online flash card exercise with a score of 45 or better for 4 points; 40-44 for 3 points; 36-40 for 2 points; 32-35 for 1 point. The student may attempt this exercises as many time as it take to be proficient in spelling the elements. Below is the list of 54 elements required for the CHM 2045C class which are included in the exercise in #2 above. However, the above table includes Palladium (Pd) and Plutonium (Pu) which are not included in the online exercise but may be on the exam. Elements highlighted are additional elements required for 1025 Students in addition to basic 47.